Carolers and a military tribute salute "The Nation's Christmas Tree." 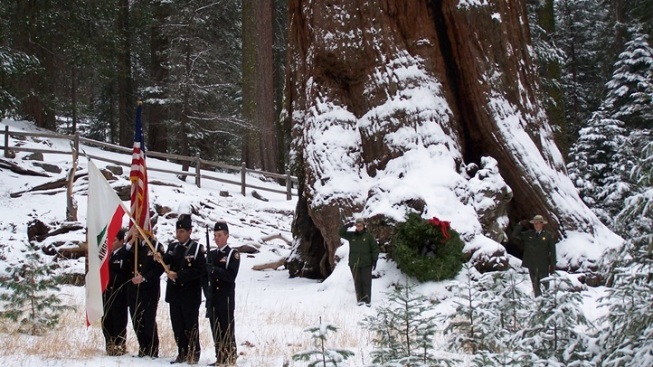 The General Grant has been known as "The Nation's Christmas Tree" since the '20s. Want to have a reverent moment in the possibly snowy Sequoia and King's Canyon National Park. Make "The Trek to the Tree" on Sunday, Dec. 14. GENTLE GIANT: There are, without doubt, some very celebrated and photographed and visited trees that pop up around the country come Christmas time. The White House tree is one of the most well-known, and the shrub that dominates the ice rink at Rockefeller Center, and city trees from Chicago to Atlanta to LA (where the "world's tallest live cut tree" stands at The Citadel Outlets). But few celebrated Christmas trees actually still stand where they grew, with roots in the ground. One major example does, and it in fact earned the title "The Nation's Christmas Tree" from President Calvin Coolidge back in the 1920s. IF YOU'RE GUESSING... that it has to be in a national park, probably located within the Golden State, given our rep for plants of a very colossal nature, you'd be totally correct. If you're guessing it is a redwood or sequoia, you're in the right ballpark (or, um, national park). And if you think it might be a tree that already comes with its own name and well-documented stats, right again: The Nation's Christmas Tree is the General Grant, which is located in King's Canyon. And each and every December fans snowboot-up and make for a touching tribute, complete with carols and a salute to lives lost by members of the military. SUNDAY, DEC. 14: Revelers and those wishing to have a reverent moment will head into the possibly snowy giant sequoia grove on the middle Sunday of the last month of the year. It's year 89 for The Trek to the Tree, and The Grant Grove Restaurant has a special holiday menu available in honor of the day (for either lunch or dinner, note). The Trek happens at 2:30 in the afternoon, and there are buses from Sanger or you can drive yourself in. It's a good thing to get the details on this one, since you're going deep into the forest of giants, and deep into our national past and the spirit of the season, too.